The upscale townhome development along the Lake Union waterfront in Eastlake, which we profiled last year, is progressing forward. According to Nick Glant of NWG Real Estate, the project has secured enough pre-sales to begin construction this year, with the delivery of its first phase of nine homes in late 2011. The Enclave (website) features 21 multi-level residences designed by NBBJ and Atelierjones, which are constucted of glass, Prodema, steel, concrete and engineered siding. These lake side homes range in size from 2,500 to more than 3,000 square feet and start from $1.3 million. Prospective buyers may view further information at the sales center, which is by appointment only. Escala (website) reported that they’ve reached 70 contracted homes sales since the new team took over 5 months ago and are approaching 50 closed transactions. The sales center is open every weekend from 11 am to 5 pm or by appointment. Congratulations to Schnitzer West for successfully concluding sales at Brix. Just 3 weeks ago we reported Brix was in the process of closing out the project with just 5 units remaining…all 5 are now under contract. 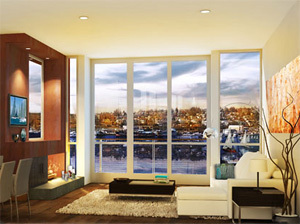 The Lakeview Residences (website) is a small six-unit boutique condominium located on the West-slope of Capitol Hill. The high-end homes range in size from approximately 1,400 to 1,670 square feet and are now priced from the low $600,000s. When these home first came on the market, they were priced well above $1 million. Currently, only 3 homes remain, 1 of each distinct floor plan. Christine Keff, the James Beard award winning chef and restaurateur of the Flying Fish has opened a new artisan cafe in South Lake Union called On the Fly. The shop, located at 950 Thomas Street, will feature baked goods, espresso, lunches, a selection of wines and fully prepared take-home dinners. On the Fly will be open Monday through Friday from 10 am to 7 pm, after Labor Day.